The J/24 class in Italy continues to reign supreme as the preeminent one-design class across the country. With hundreds of boats spread across the country, it’s easy to hop into one, give the boat a “refresher” and go sailing with friends. 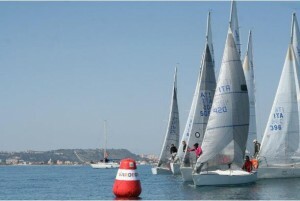 The J/24 Winter Regatta circuit is conducted in five sailing areas around Italy, from the North to the South, from East to West. Here are some quick updates on their activity since the start of 2012. MARINA DI CAPITANA- Out on the island of Sardinia, the J/24 fleet has been having a much harder time getting their winter series rolling due to incredibly bad weather. Whatever they’ve been getting on the mainland, it’s only twice as worse or more out on the island, especially with the winds in the ENE quadrants- mistrals are rough going on the northeastern shores of Sardinia. The Winter Series Championship is organized by the Yacht Club St. Helens under the auspices of the Italian Sailing Federation, with assistance of the Port of Cagliari. Despite the dismal weather, the first weekend of actual sailing had a welcoming sun and the nice wind made for three great races. At the top of the leader board with three 1sts is ITA-103 sailed by Paco Jadine. Just behind them is Laura De Luisa on DELL’INCIVISI Sailing Team with a 3-2-2. Lying third is an all-girl team lead by Claudia Barbara sailing EXPRESSIVE MEDIFARMA with a 2-4-3.